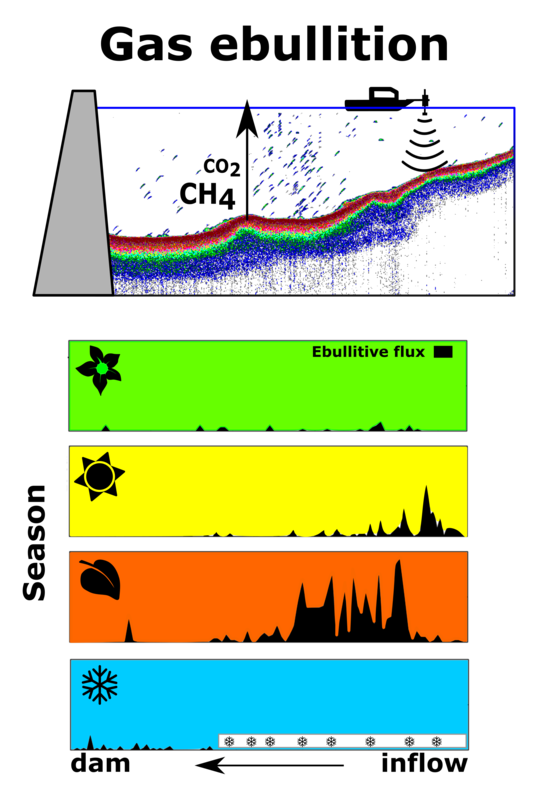 Gas ebullition of river impoundments plays an increasingly signiﬁcant role, particularly in transporting methane CH4 from their sediments to the atmosphere, and contributing to the global carbon budget and global warming. Quantifying stochastic and episodic nature of gas ebullition is complicated especially when conventionally conducted by using coverage-limited gas traps. Current knowledge of seasonality in a reservoir’s gas ebullition is lacking in the literature. For this reason, advanced acoustic surveying was intensively applied to determine spatiotemporal distributions of gas ebullition in a European water-storage reservoir for two years. Additionally, the sampling was accompanied with gas collecting for analyzing gas composition. The gas released from the reservoir was primarily composed of CH4 (on average 52%, up to 94%). The longitudinal distribution of gas ebullition was mainly determined by a proximity to the river inﬂow as a source of organic matter. A magnitude of ebullitive ﬂuxes within the reservoir varied up to 1,300 mL m-2 d-1 (30 mmol CH4 m-2 d-1). The most signiﬁcant period of ebullition has turned out to be in fall, on average reaching a sevenfold ebullitive ﬂux (70 mL m-2 d-1, 1.6 mmol CH4 m-2 d-1) higher than in the rest of the season. A substantial contribution to the fall peak was induced by an expansion of gas ebullition into greater depths, covering two thirds of the reservoir in late fall. The study demonstrates that the ebullitive ﬂuxes of the temperate water storage reservoir were correlated to season, depth, and inﬂow proximity.